Cold weather has finally reached the Midwest. With temperatures dipping into the 20's I can't deny autumn has arrived. Cold weather and falling leaves always make me start to think of football games, bonfires and hearty, steaming bowls of chili. 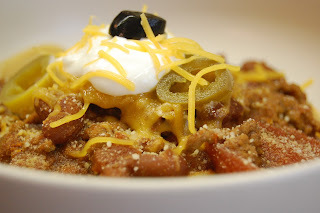 Way back in the dim and distant past when the internet was a new concept, I discovered a recipe for chili on AOL that has become a family staple. Sponge's Mom's Chili was one of the first recipes I found online and definitely the most enduring. I didn't cook much back in those days and this idiot-proof recipe was the one thing I could make with guaranteed success. I have no idea who Sponge is and the recipe isn't up on AOL any longer, but if anybody knows Sponge, tell him his mom rocks! Since October is National Chili Month, this is the perfect time to have a great bowl of chili. One thing I always do to chili to make it extra special is to serve it with lots of topping options: cheddar cheese, spaghetti and sour cream, of course. But jalapeno pepper slices, Parmesan cheese, your favorite salsa, or hot sauce, diced onions and even guacamole, can make any chili recipe shine. At home, I usually top everyone's bowl the way I know they like it. When we have company I usually set out bowls of toppings, buffet-style and let everyone serve themselves. Simple and easy to prepare ahead of times, it always gets rave reviews, perfect for any fall get together. Brown ground beef and onions. Drain. Coat meat mixture with dry ingredients and place in pot. Add tomato sauce and 2 cans of water. Add stewed tomatoes and 1 can of water. Add beans. Stir. Bring to a boil then lower heat and simmer for 1 hour. Add toppings of your choice and serve. Chili is an alltime favorite cold weather food. We just love it and this recipe sounds delish! I love a good chili recipe and this looks great!